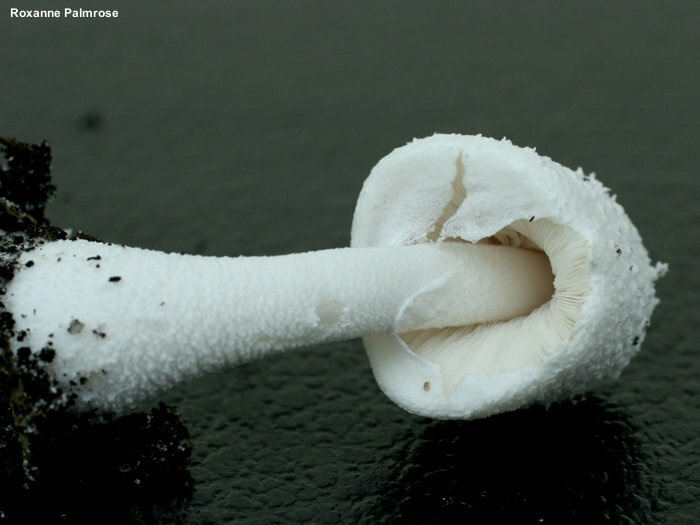 This little lepiotoid mushroom is fairly uncommon, and appears in greenhouses, with potted plants, and in planters—especially in tropical and subtropical areas. 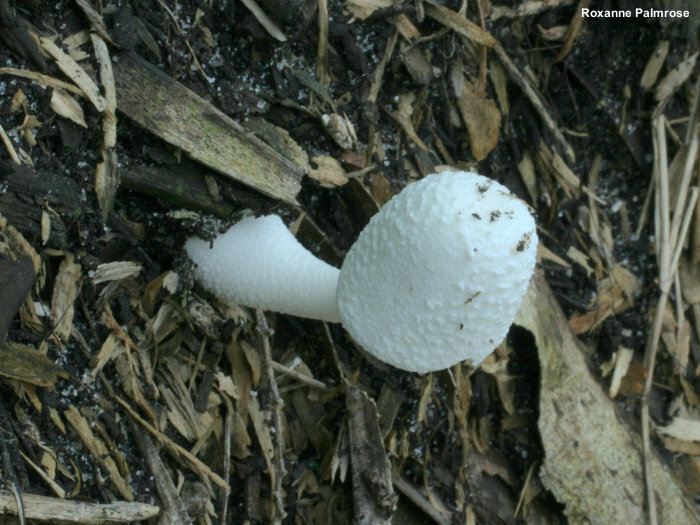 It features an all-white cap and stem that are covered, when fresh and young, with small, wart-like scales. Leucocoprinus cepaestipes is somewhat similar, but its stem is relatively bald, its cap features a granular to powdery surface, and it is much more common—usually appearing outdoors, in woodchips or landscaping areas. Leucocoprinus cretaceus has, under the microscope, an interesting cap surface; the hyphae feature projections and are often branched and fragmented in ways that suggest alphabet soup that has been stirred too hard, so that the little pasta letters are mostly broken up into pieces. My concept of Leucocoprinus cretaceus has changed over the years, and has been recently clarified by the contribution of specimens from this site's readers. See the discussion on the page for Leucocoprinus cepaestipes if you care. Lepiota cretacea is a synonym. Thanks to Francisco Moreno and Roxanne Palmrose for collecting, documenting, and preserving Leucocoprinus cretaceus for study; their collections are deposited in The Herbarium of Michael Kuo. 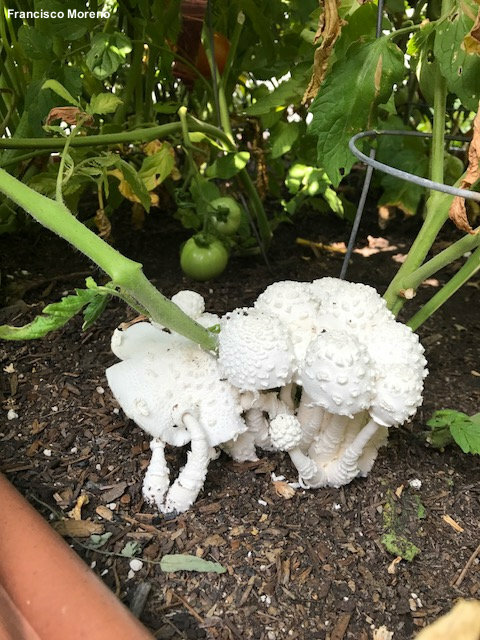 Ecology: Saprobic; growing alone, in groups, or in loose clusters in potted plants, greenhouses, planters, and so on; appearing year-round; North American distribution uncertain, but apparently uncommon, and more likely to appear in tropical and subtropical areas. The illustrated and described collections are from California and Florida. 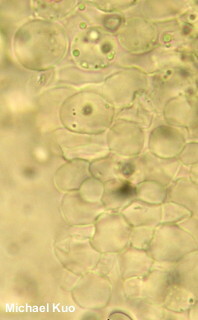 Cap: 2–8 cm; roundish or blocky and subcylindric when young, expanding to convex or nearly flat; dry; white; covered with small, wart-like scales. Gills: Free from the stem; close or crowded; short-gills frequent; white. 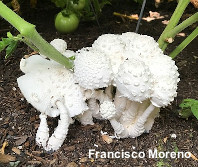 Stem: 3–8 cm long; 5–10 mm thick; with a moderately swollen base; covered with soft scales like those on the cap; white; with a fragile, white ring; basal mycelium white; attached to white rhizomorphs. Spore Print: Reported as white to creamy. 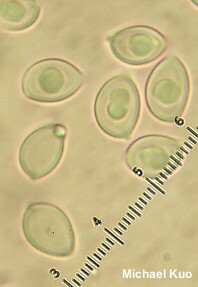 Microscopic Features: Spores 6–12 x 4–7 µm; subamygdaliform to ellipsoid; smooth; with a small pore; thick-walled; hyaline to slightly yellowish in KOH; dextrinoid. Basidia 4-sterigmate. 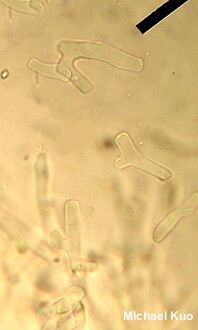 Pavement cells present. 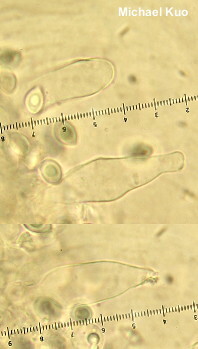 Cheilocystidia 35–75 x 7.5–15 µm; widely cylindric to widely fusiform or subcapitate; smooth; occasionally with refractive apical encrustations; thin-walled; hyaline in KOH. 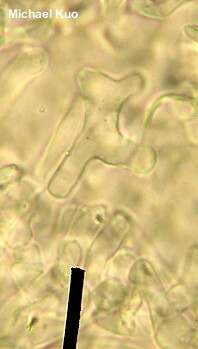 Pleurocystidia not found. 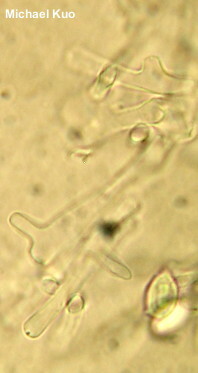 Pileipellis a densely interwoven cutis of hyaline to yellowish, smooth elements 5–7.5 µm wide; terminal cells occasionally cylindric but more often with branches and outgrowths, often forming shapes suggestive of letters or letter pieces, these elements 4–10+ µm wide, smooth, occasionally with walls up to 1 µm thick, hyaline in KOH, fragmenting. REFERENCES: (Buillard, 1788) Locquin, 1945. 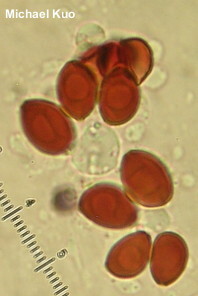 (Fries, 1821; Saccardo, 1887; Vellinga, 2001e; Vellinga, 2009.) Herb. Kuo 12101504, 08151701.